For the centenary of the First World War, Anthony Seldon and David Walsh have written a comprehensive survey of the role of public schoolboys in the conflict. The King’s School was relatively small in 1914, with 148 boys in the senior school in the Summer Term. Yet 161 old boys were to be killed, as well as two masters. These proportions are typical of boarding schools of the period. The book looks at the nature of public schools and at the contribution of their young officers. 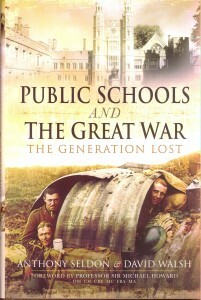 There are also chapters on the impact of the war on school life and on the ways in which schools commemorated the dead. The book concludes with a discussion on the extent to which this was indeed a ‘lost generation’. With an average of nearly 1 in 5 of old boys who served being killed, the impact was undoubtedly severe. The King’s School features significantly in the book.